I was in Washington, D.C. on March 24. While my flight was too late for me to attend the March for Our Lives, I saw and felt the aftermath. There was a feeling of excitement and inspiration among the young people in D.C. They were carrying posters and chanting slogans to rally for their cause. Along the south side of the White House there were barricades that had colorful posters woven into them expressing the feelings of the people. Not all were anti-gun, but all were anti-school violence. It was an uplifting day, one where a community and a nation could express themselves and feel that they were making a difference. One where young people — people my age — were involved and engaged. We need to continue to be involved. If we remain engaged through November and beyond, our generation can have a positive effect. Voting is more powerful than protesting, albeit less exciting. Going into a small booth in a local fire station or community center doesn’t have the glitz and glamour of a televised protest, but it actually makes the difference. 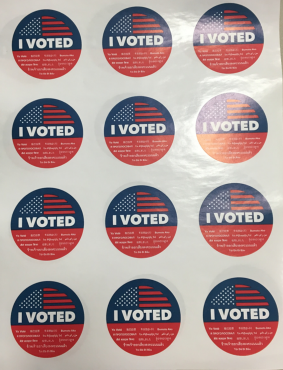 In the California primaries on June 5, the voter turnout in Los Angeles County was 18.5 percent at current count. That’s correct. Less than 20 percent of the registered voters in Los Angeles had a say in the outcome of the election. Our generation cannot afford to be that apathetic. Our voices will only truly be heard if we bother to vote. Many people in my generation think that the laws and policies don’t affect us directly, but we are starting to wake up and see that they do. With adulthood coming faster than many of us want, we will be even more affected by the decision our leaders make. We should become knowledgeable about our leaders and be prepared to cast a ballot for those who will represent us best. The issues facing us nationally, such as gun control and immigration, are big, but we also have local issues that affect our daily lives more, such as transportation, water usage, and affordable housing. Again, these are not the subjects of political soundbites heard on the news, but they are among the issues we need to help shape, as they are the issues affecting lives in the future. The only way for the youth vote to count — is for the youth to vote. March 24 was a start, but we must continue to express ourselves at the polls.